John Negroponte won easy approval by the Senate on Thursday to become the nation's first national intelligence director, a job created last year to better coordinate the nation's spy agencies following the Sept. 11 attacks and other intelligence blunders. 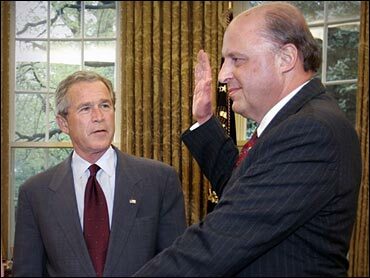 Within 45 minutes of his approval, Negroponte was sworn in at the White House by chief of staff Andrew Card as President Bush witnessed the ceremony. Negroponte will take over the task of giving Bush a daily briefing on intelligence matters, probably beginning next week, presidential spokesman Scott McClellan said. Negroponte, 65, has called this his "most challenging assignment" in more than 40 years of government service. The Senate voted 98-2 to give the former Iraq ambassador the job. He takes over an intelligence community that's been criticized in report after report for failures leading up to the attacks of Sept. 11, and for its prewar intelligence on Iraq. "He's going to carry heavy burdens," said Senate Intelligence Chairman Pat Roberts, R-Kansas. "I am convinced, however, that he has the character, that he has the expertise, and he has the leadership skills to successfully meet these challenges and shoulder these responsibilities." Negroponte, whose approval by the committee and the full Senate are not in doubt, fended off Democratic suggestions that he may not be an impartial arbiter of intelligence. To make their point, Democrats turned to his record as ambassador to Honduras during the tumult in Latin American during the 1980s. "The focus of the Senate nomination hearing for Ambassador Negroponte to be national intelligence chief was 'how to avoid another 9/11'" said CBS News Foreign Affairs Analyst Pamela Falk. "But Committee members took the opportunity during what was Negroponte's seventh set of confirmation hearings to cover almost two dozen issues including human intelligence, partisan analysis of information, the colossal failure of weapons of mass destruction (WMD) intelligence in Iraq to his time in Honduras." Last summer, the independent Sept. 11 Commission called on Congress to create a single, powerful director to oversee all 15 agencies in the intelligence community. Congress approved the new post in December as part of the most significant overhaul since 1947. Yet intelligence veterans and some lawmakers still question whether the job comes with enough power to lead the highly competitive government elements that handle everything from recruiting spies to studying satellite imagery. In announcing Negroponte's nomination in February, President Bush said, "If we're going to stop the terrorists before they strike, we must ensure that our intelligence agencies work as a single, unified enterprise." Since leaving Iraq last month, Negroponte has embarked on a campaign to meet numerous members of Congress. West Virginia Sen. Jay Rockefeller, the top Democrat on the intelligence panel, has said he spent 90 minutes with the incoming chief, discussing issues including whether changes are needed in Negroponte's powers. "Reform of the intelligence community will involve stepping on the turf of some of the most powerful bureaucracies in Washington, first and foremost among those is the Department of Defense," Rockefeller said Thursday. The Pentagon controls 80 percent of the intelligence community's estimated $40 billion budget. Sen. Tom Harkin, D-Iowa, joined Sen. Ron Wyden, D-Ore., in opposing the nomination. Wyden has said Negroponte ducked a number of issues at his confirmation hearing this month and has questioned whether Negroponte had adequately reported human rights abuses as ambassador to Honduras in the 1980s. "I believe the record of the ambassador's service there is particularly telling in terms of his judgment and his willingness to confront difficult facts, which I believe are two key requirements for the director of national intelligence," Wyden said. A diplomat most of his career, Negroponte speaks five languages and has held official posts in eight countries, including ambassadorships in Mexico and the Philippines. He served in President Reagan's National Security Council from 1987 to 1989. While Negroponte's support crossed party lines, deeper political issues lie ahead. During debate on his confirmation, Rockefeller reiterated ongoing Democratic requests for a Senate investigation into U.S. interrogation policy and prisoner abuse. He said none of the many inquiries thus far have looked at the CIA's role in cases that have reached around the globe. Roberts said such an investigation would lead to partisanship and consume Negroponte's energy as he starts the new job. "I am fast losing patience with what appears to me to be an almost pathological obsession with calling into question the actions of the men and woman who are on the front lines of the war on terror," he said.